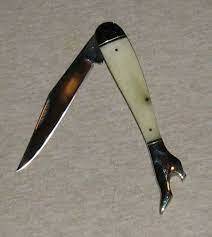 Frankly I bought this knife because it is the closest thing to a large toothpick in Rough Rider’s white smooth bone. The knife is well made, the shoe is a functioning cap lifter, blade opens and closes smoothly with good snap, has excellent stay and play (no noticeable wobble) . I really like the blade shape and it is absolutely razor sharp. With all that said, it is a poor substitute for the traditional large toothpick. Leg collectors will like it. Large toothpick collectors will find it a poor substitute for their collection. Rough Rider makes the large Lady's leg in several pattenrs including: RR 088 - amber jigged, .RR 288 - red jigged, RR957 - Bowie Series, RR1121 - Pink Support the Cause, RR1123 - RedSupport the Cause, RR782 - Outdoorsman, RR348 - Imitation Abalone, RR 504- Tortoise shell, RR Orange Smooth, RR1163 - Stoneworx (2 blade), and perhaps others.